We're flashing WAY back this month, with a reissue of 1963 recordings which actually take us back to the early part of the century. Memphis banjo player Gus Cannon's music career dated back to around 1900, as he spent the century's first 15 years as a medicine show performer. He first recorded for Paramount in 1924 under the name "Banjo Joe," then cut 26 sides for Victor between 1928 and 1930 with his group "Cannon's Jug Stompers," as well as a few recordings for Brunswick as the "Beale Street Boys." The story then moves ahead to 1963, when a Greenwich Village folk group, the Rooftop Singers, had a number one Billboard hit with Cannon's "Walk Right In." Suddenly, the national media, as well as other folkies of that era, descended on Memphis in search of the 79-year-old Cannon. Unfortunately, Cannon never got any royalties from the recording of his song. 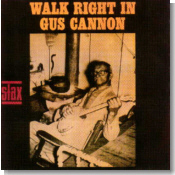 But at least the success of "Walk Right In" propelled Memphis-based Stax Records to bring Cannon into the studio, accompanied by fellow jug band stalwarts Will Shade and Milton Roby. Only 500 copies of this album, Walk Right In, were pressed, so it quickly became a much sought after collector's item. Walk Right In is now available on CD for the first time, so we all get another chance to hear this fascinating slice of Americana. The music here harkens back to a time when blues musicians played acoustic string instruments, blew into jugs, and rubbed on washboards, while hucksters connived small town rubes into buying bottles of elixir of questionable medicinal value. Cannon reprises his hit "Walk Right In" --- if you're not sure you've ever heard this song before, trust me, you have. There are also versions of traditional tunes like "Salty Dog," "Make Me A Pallet On Your Floor," and "Crawdad Hole." I also really liked the great raggedy uptempo number "Ain't Gonna Rain No More." The only accompaniment to Cannon's still-nimble banjo pickin' is Shade's blowing on a jug and Roby's washboard scrubbing. What makes this disc even more valuable is Cannon's narration and story-telling between many of the songs. Something tells me that this man had many more stories to tell. He lived until the ripe old age of 96, so it's a shame that he didn't leave more of a recorded legacy.